Could this be the spark that ignites World War 3? Since the Syrian conflict officially began in 2011, the fighting has been largely focused on Syrian factions vying for power. Though these factions are backed by foreign governments seeking to either remove or support Syrian President Bashar Al-Assad, such governments have avoided officially directly attacking either the Syrian “rebels” or the Syrian Army excluding the occasional “mistaken” airstrike. However, just moments ago, all that changed when Israel – which has supported Syrian “rebels” as well as the Islamic State – launched a direct attack on Syria’s government. Syrian state news agency SANA has reported that Israeli jets bombed the Mezzeh military airport just west of Syria’s capital Damascus at 12 AM local time. Reports indicate that the airport was rocked by multiple explosions and that one of the compounds of the key military facility was damaged. The airport is located just 5 kilometers from the Presidential Palace, Assad’s official residence. The Syrian Army was quick to respond, accusing Israel’s leadership in Tel Aviv of supporting terrorism and vowing to retaliate for the “flagrant attack” of a Syrian military base. Considering the recent nature of the attack, no information regarding the death toll is available at this time. However, reports have noted that the military airport houses Syria’s elite Republican Guards and Special Forces. According to the Syrian Army, the missiles responsible for the bombing were fired from the Lake Tiberias area of Northern Israel. Various video clips depicting heavy fire and explosions have since surfaced on social media, depicting the severity of the attack. The timing of this bombing is also peculiar and could mark an attempt by Israel and its allies to push through its regime change agenda in Syria before outgoing-President Obama leaves office. Obama, set to leave office in less than a week, has been a major proponent of removing Assad from power while also escalating the role of the US military in Syria. Unable to justify direct US military action against the Syrian government – despite a significant PR campaign to do just that – it seems that those countries that oppose Assad have chosen to make their move before Donald Trump takes office in a matter of days. Trump has repeatedly stated his opposition to regime change in Syria as well as a desire to cooperate with Russia – Syria’s chief ally – in order to defeat the Islamic State. However, this flies in the face of the plans of the neo-liberal global order, of which the current regimes of both Israel and the US are a part of. In addition, Assad’s recent victories in Aleppo and elsewhere made it clear that the US and Israel-backed factions fighting the Syrian government could soon be overrun and ineffective in destabilizing Assad’s regime. Israel, clearly aware of the situation, made the choice to act. Now, the ultimate outcome of the fragile situation in Syria depends on the retaliation of the Syrian Army against Israel. 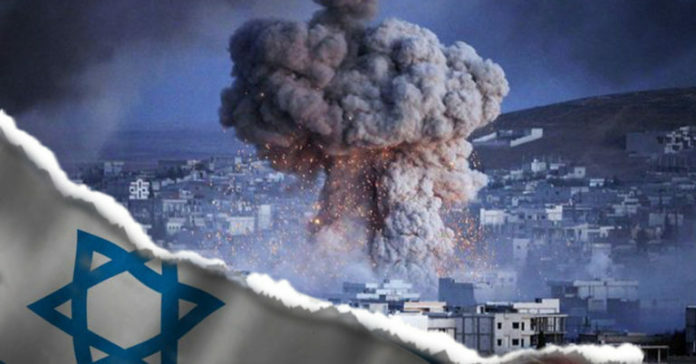 Though Syria is justified in responding to a direct attack on its military infrastructure, any attack on Israel would promptly provoke declarations of war from both Israel and its ever-faithful ally the United States. Such declarations would, in turn, bring Russia, Iran, and ostensibly China into the fray as all three have vowed to protect Syria in the event of war erupting between Assad’s regime and the foreign powers that have long sought to destabilize its rule. In order to prevent catastrophe, people must stand up the neo-liberal global order now more than ever, demanding an end to senseless wars and refusing to support Israel’s attempts to stoke a war that could have devastating and global consequences. This article (BREAKING: Israel Bombs Syrian Military Airport In Damascus, Syria Promises Retaliation) is free and open source. You have permission to republish this article under a Creative Commons license with attribution to the author and True Activist.